The Blue Mosque and the Hagia Sophia dominate this part of the city. They look at one another with 2000 years of built history between them. One is a living mosque, the other a museum having been both a mosque and a church. 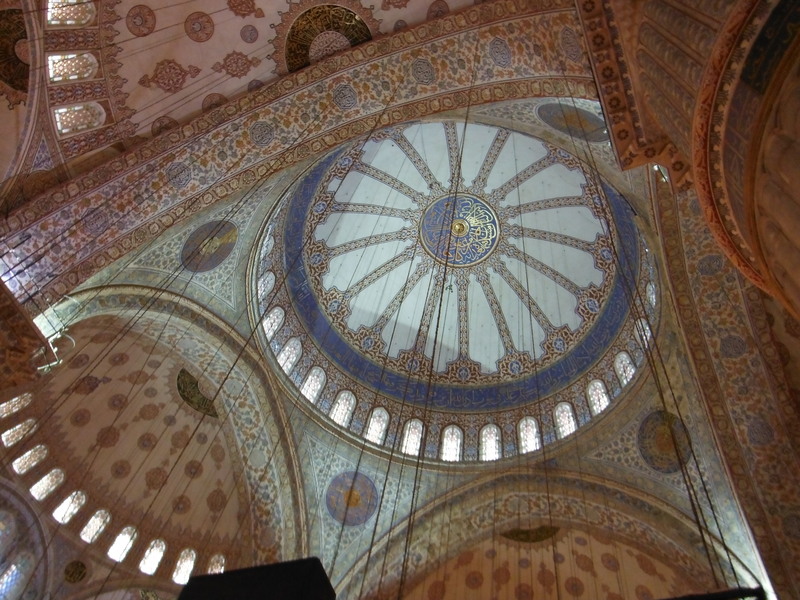 The Blue Mosque is blue by virtue of the blue tiles that adorn the walls. The dome (left) is vertiginous. However, the mosque is not as blue as the name suggests, but as a place of worship, one is in awe of its scale. The Hagia Sophia was designated a museum in 1934 by the state’s founder, Ataturk himself. I suspect February is not the best time to visit as it is a naturally dark and cool space. But the scale is incomprehensible and the remnants of the mosaics stunning. 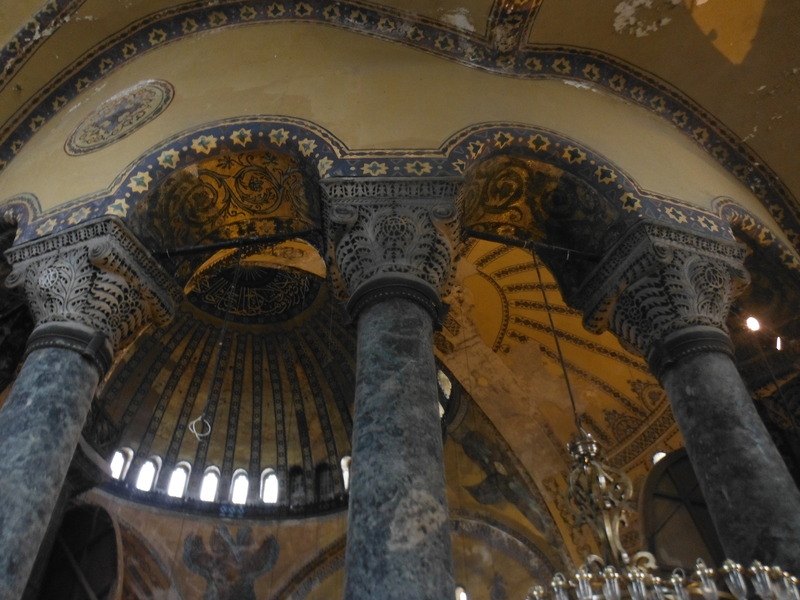 There are two levels for visitors – ground level where one finds the alter, and a mezanine where one finds the mosaics coupled with an elevated panorama. 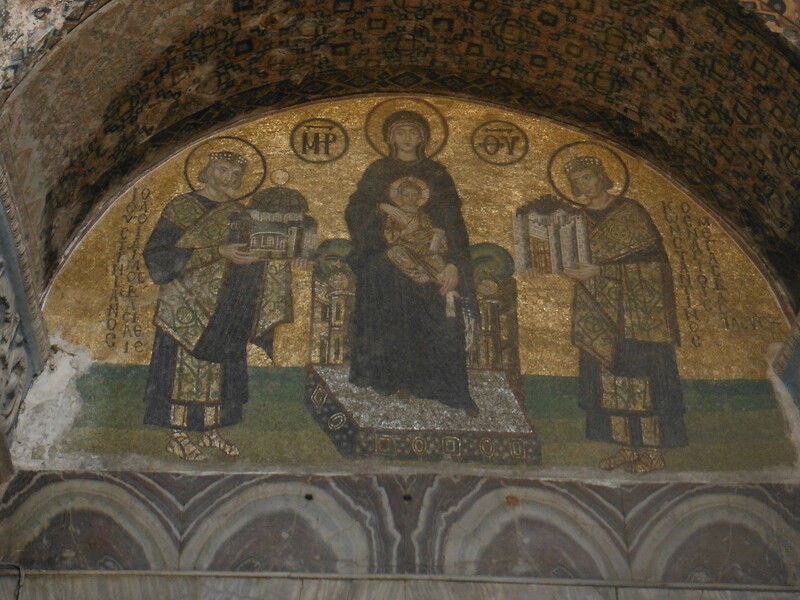 The mosaic on the right – the Virgin receiving a model of the new church from Justinianus and the city from Constantine (10th Century). The columns below are pervasive around the building, but have some beauty in their detail. The Grand Bazaar is as one would expect. Large, Byzantine (of course) and challenging. However, it is not a Souk similar to what I have experienced in Marakesh, for example. The Grand Bazaar is merely a glorified shopping centre, complete with cash machines for those caught without enough currency. We visitors are always at a disadvantage when it comes to bartering, but we came away with a few items at prices that we can live with. Lots of textiles, leather goods, spices and trinkets. Very busy, of course. Today the sun shines. Time for a go on the ferries along the Bosphorus.